Last March the voters of Londonderry approved Article 15. 1,108 residents voted yes, 830 voted no, and 156 left the question blank. The Town Council by a vote of 4-1 recommends a NO vote; the Budget Committee did not vote on this item as it is non-monetary. In the seven months since the article was passed there has been no discussion by the Town Council. Resident Deb Paul, who submitted the petition, attended the Town Council meeting on October 17, 2016 to ask why. Here is the conversation from the meeting. Video of the meeting is available LACTV.com HERE beginning at 27:32 minutes into the meeting. Chairman Farrell “So have the town attorney look at it and advise us on it. The last thing I remember on it was that it is that there are no, that the state speaks on that, and so if you can bring that to us and what the state says, then we will take a look at it. OK? Here is my question. What took so long? Why did the Town Council do nothing with a request from 1,108 citizens for 7 months? Would anything have been done if Deb Paul did not attend the meeting and ask what is being done? 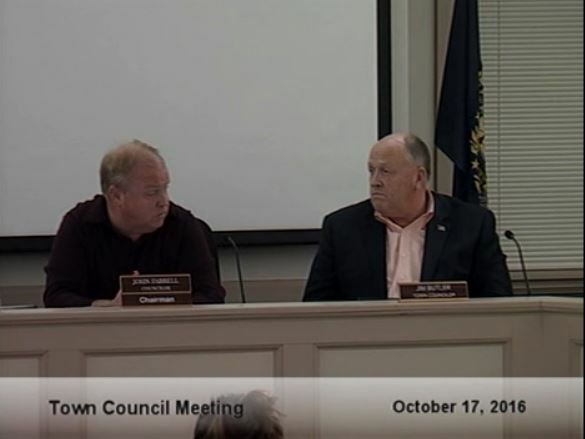 Town Councilors are elected to represent the residents, it was clear on March 8, 2016 that the residents have an interest in looking into the question of term limits. It’s time these councilors take action.